Our system of government is extremely adaptable, writes Senator Peter Harder, and our Senate does not have to be identical to the House of Lords. This article was originally published in Policy Options on November 22, 2016. The 150-year-old duopoly of Conservatives and Liberals in the Red Chamber is over — of that there can be little doubt. But those who would argue by extension that the end of the two-party system means the winding up of the traditional Westminster system of government need to stop worrying. Regardless of what happens in the Senate over the next few years, the cabinet system of government will live on, Parliament’s bicameral nature will persist, and it will still take a majority of MPs to keep a government afloat. All these and other characteristics of the Westminster system will not change simply because the Senate will be occupied by independent members. It’s my view that Prime Minister Justin Trudeau’s decision three years ago to remove Senate Liberals from the national Liberal caucus and to appoint independent Senators presents a historic opportunity to improve the institution from within. Trudeau has launched the Senate into uncharted waters, and the onus is on the Senate to navigate a wise course. Currently, 44 Senators out of the 105-member Upper Chamber — a plurality — are independent Senators who come from all walks of life, with most having never been involved in politics. They are the cream of the crop in their respective and diversified fields. And the overwhelmingly positive reactions that their appointments have garnered is highly encouraging for the institution. Still, many Senators remain openly hostile to removing the government/opposition dynamic from the Senate, a change that, they argue, abridges our traditional understanding of the Westminster system of government. Some in the Senate have gone as far as accusing this author of being “radical” and “slyly subversive” for suggesting that the Senate move away from this dynamic. I concede that this is an approach that has not been part of the Senate’s history. Conservatives and Liberals have been a constant feature of the Senate since its creation. 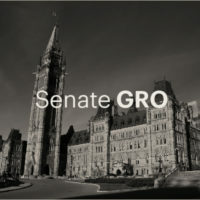 The Senate of Canada has functioned with government and opposition representative roles, and most legislative chambers modelled on the Westminster tradition have an organized government and an organized official opposition. These facts go some way in explaining the muscular language of many party-affiliated Senators, some of whom have painted the prospect of a Senate composed of independent members as an affront to the Westminster model. But to suggest that Canada’s constitutional framework requires us to rigidly preserve all the hallmarks of the model, including the adversarial government/opposition framework, is untrue. Canadians should not be misled by these tall tales of withering Westminster. The truth is that the Westminster model is neither rigid nor inflexible. In fact, the Westminster system is extremely nimble, which helps to explain why it has been adopted in so many different national and subnational jurisdictions, from New Zealand to Nunavut. The Westminster model is just that: a model. The Canadian Senate was not meant to be an identical twin of the House of Lords, but is rather a progeny with a distinct design intended to evolve and adapt according to Canada’s legal, political, historical and social-cultural environment. In fact, the preamble to the Constitution Act provides that Canada’s Constitution is to be “similar in principle to that of the United Kingdom,” not identical. Jurisdictions that have inherited or adopted the Westminster model have tailored it to suit local traditions, histories and cultures. For example, while most Westminster countries continue to use Upper Chambers, many do not. Perhaps most prominently, New Zealand abolished its Upper Chamber, and its legislature is now unicameral. The New Zealand Parliament nonetheless is still classified as a Westminster-style democracy because it retains the key elements of that system: responsible government and the confidence convention. There are countless variations in the features of Upper Houses in Westminster countries: some are appointed (as in the U.K. and Canada), some are elected (for example, Australia’s), and others are selected by subnational governments (as in India). The Canadian Senate is itself quite unique in the Westminster tradition and very different from the Lords. For example, to my knowledge, Canada is one of only two bicameral jurisdictions to have an unelected Upper Chamber with full veto powers over legislation. The other is Trinidad and Tobago, but in that jurisdiction Senators are appointed only for the duration of one Parliament. Moreover, the Trinidadian Senate loses its veto power when an identical bill has been passed by the elected Lower House in two successive sessions. No such restriction exists in Canada. Ultimately, as Senate expert David E. Smith explains in his 2003 book on the Canadian Senate, there is plainly no other unelected chamber that possesses similar power to ours. Unlike the Lords, the Senate of Canada is the Upper House of a federation. The role of regional representation, attributed to the Senate to counterbalance the population-based representation in the Lower House, was the principal rationale for its creation. There are other key differences. The Canadian Senate has a fixed number of members; the Lords does not. The former is empowered with a full veto, while the latter wields a suspensive veto. Despite all these differences (and there are many others), both are Upper Chambers in a Westminster parliamentary system. There are even a few examples of chambers in Westminster-style systems in which there is no political party affiliation. Tuvalu, a small nation in Polynesia, has a Westminster-style parliament where there are no formal political parties and in which the cabinet is collectively responsible to Parliament for its actions. Right here at home, there are two very relevant examples of legislatures governed by the principal tenets of Westminster that do not conform to the confrontational, party-based government/opposition structure. Indeed, the legislative assemblies of Nunavut and the Northwest Territories have Westminster-style systems, but they have welded onto them a decision-making process based on the absence of political parties. They have adopted a deliberative model of decision-making that has been dubbed “consensus government,” under which all members of the legislative assemblies are elected as independent candidates. In thinking about the territories’ legislative assemblies, it struck me that a more deliberative, independent and less partisan Senate may actually bring the institution closer in tone and style to the traditions of Indigenous peoples. And why should we not look to them for renewal? There is something profound to the notion that Indigenous traditions could assist us in discharging the constitutional role the founders of Confederation envisioned for the Senate. When considering whether our political order is departing from an essential feature of the Westminster model, one must look to the Parliament of Canada as a whole. If we assume that the Senate, as a stand-alone chamber, must have all the key features of the Westminster model, then it would already be in default: it is not a confidence chamber but one of complementarity. The confidence chamber in Canada is the House of Commons, where the party-based government/opposition model will also persist. The latter will continue to preserve, within the Parliament of Canada, the adversarial and party-based government/opposition model. I believe that a compelling argument could be made that the adversarial and party-based government/opposition model has actually hindered the Senate in discharging its role in Canada’s constitutional framework. The Supreme Court of Canada has described the role of the Senate as that of a complementary, thoroughly independent and less partisan legislative body of sober second thought. To the justices, the founders sought to endow the Senate with independence from the electoral process to which members of the House of Commons were subject, in order to remove Senators from a partisan political arena that required unremitting consideration of short-term political objectives. Far from realizing the founders’ intent of a body that would “canvass dispassionately the measures of the House of Commons,” as the Supreme Court described it (Sir John A. Macdonald spoke of an independent house “calmly considering the legislation initiated by the popular branch”), the party-based government/opposition model supposes perpetual adversarial interaction between organized and cohesive partisan political groups, thereby generating a less sober and more partisan framework for legislative review. I understand very well that not all Senators feel duty-bound to toe the party line, and that some take offence at the suggestion that party affiliation is inconsistent with independence. Indeed, there are many examples of party-affiliated Senators with an impressively independent streak. But, quite frankly, the mavericks have been the exception rather than the rule. It takes a special sort of person to have the courage to stand up to the leader of his or her own political party, often the very Prime Minister who made one’s appointment. For the foregoing reasons, far from precluding the adaptation of the traditional Westminster-style party-based government/opposition dynamic, the constitutional framework of the Senate actually warrants it. Ironically, distancing the Senate from the way it has operated in practice will actually bring Canada’s Upper House closer to the independent, non-partisan and complementary body that the framers of Confederation envisioned. In my opinion, the complementary tones and approaches to debate of the two chambers of Canada’s bicameral legislature will generate an equilibrium that is entirely in keeping with the intent of the founders of Canada. In sum, maintaining the party-based government/opposition dynamic would undermine the fundamental constitutional purpose of our appointed Upper House. By the same token, I am confident that the emergence of a new, more sober and more deliberative model for the expression of opposition to Government initiatives will better serve the public interest. At the risk of sounding biased, I think that my team in the Office of the Representative of the Government in the Senate is a good starting point toward a new model, insofar as it provides a nexus between the Senate and the other institutions of Parliament and Government. The Government Representative manages the timing and process for the debate and passage of Government legislation in the Senate. The office also works to provide Government information to Senators, and to convey Senators’ views to the Government. But the very existence of my office raises an interesting question: should a Senate of independents have an equivalent to my own role — an opposition representative in the Senate? I believe this idea merits exploration and serious consideration. The institution may benefit from a counterbalance to the Government Representative, as a safety net for opposing political views. Perhaps, just as the Prime Minister appoints a Government Representative, the leader of Her Majesty’s Loyal Opposition could appoint an opposition representative. As the Government Representative does not lead a whipped caucus, an opposition representative should exercise his or her power as a voice of moral suasion, rather than an instrument of top-down directives. To do so, the opposition representative would require sufficient resources to effectively communicate to Senators the perspective of the opposition with respect to the Government’s policies. In a nutshell, for those who worry about the end of the Westminster model, fear not. The reforms we are working on today will help make the Canadian version more of what it should have been all along.